Kitty Hawk and the Tragedy of the RMS Titanic is the thrillingly cryptic fourth installment of the exciting Kitty Hawk Flying Detective Agency Series featuring the intrepid teenage seaplane pilot Kitty Hawk and her various adventures of mystery and intrigue as she follows in the footsteps of Amelia Earhart on an epic flight around the world. 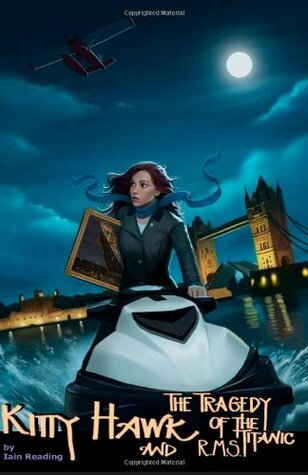 This fourth book in the series brings Kitty to the emerald hills of Ireland where she meets a handsome stranger and is quickly swept up in a perplexing hundred-year-old family treasure hunt involving secret codes and puzzling clues that lead her on a fast-paced adventure that carries her from Dublin to London – from the decks of the ill-fated ocean liner Titanic to the temples of ancient Egypt and the streets of Jack the Ripper – until she finally unlocks the mystery and discovers the long-hidden treasure. Much like the earlier books in this series, Kitty Hawk and the Tragedy of the RMS Titanic is a perfect book to fire the imaginations of armchair detectives of all ages. Filled with fascinating and highly Google-able locations and history the reader will find themselves immersed in brand new worlds that are brought to life before their very eyes as Kitty Hawk experiences the stories and history of a doomed ocean liner and unravels the Tragedy of the RMS Titanic. As someone who is completely obsessed with everything about the RMS Titanic, this was such a thrilling read for me! I love how it incorporated different parts of the history surrounding the RMS Titanic, as well as its tragic sinking over a hundred years ago. By far, I think this Kitty Hawk novel is my favorite because it focuses on the RMS Titanic, and because there was a lot more up and down thrills associated with the mystery and treasure hunt that Kitty went on. She seemed a lot more mature and developed in this novel and Iain Reading’s writing is at its best in this fourth installment. Also, the ending to this! Ack! Is there going to be a fifth one? I have to know! Even if there isn’t going to be one (sadly) I am still extremely pleased with how the series ended. The entire Kitty Hawk series is great for all ages and types of readers. I had so much fun reading all of the stories that she went on in her plane and around the world and wish there could be many more. I would recommend this series to everyone out there because its just good fun! Additionally, huge thank you to the author for providing me with the books and giving me the opportunity to read and review his novels! I can’t wait to see what else he will have in store for us! Great review! Loved hearing your thoughts on the book.